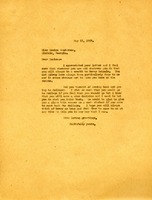 Martha Berry writes to Audrey with advice about her plans to work and get out on her own with her baby. 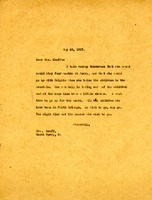 Martha Berry advises Audrey to stay with Mrs Williams and care for her baby. 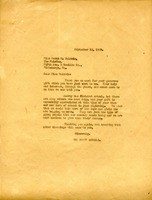 This is a letter to Mrs. Groff informing her that Audrey Henderson can remain at the school for four months to help with care for the children and to have a little change. Berry suggests that Williams and her husband try to get jobs at the Battle Creek Sanitarium, and offers to write recommendations for them. 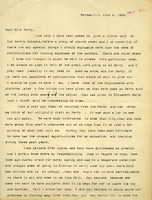 Letters between a Mrs. Nesbitt and Martha Berry speaking of an Audrey Henderson and a girl named Mary, who both married someone other than the one who they were engaged to. 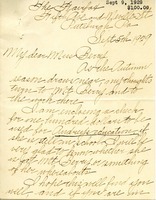 Sarah Baldwin wrote to Martha Berry and enclosed a check for $100 and she wanted it to go to Audrey's education. She also said she didn't know if Audrey was still in school but it would be nice to know where she was. She ended in mentioning her delight in having Miss Berry over to her apartment if she were to ever be in Pittsburgh. 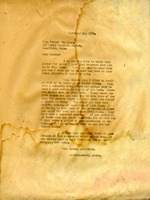 Martha Berry writes Robitzsch Long of Ocilla, Ga. to thank him for a previous letter. She reports on the intensity of the summer heat before addressing the real topic, a young woman named Audrey. It appears that she is a student or some other member of the Berry community who is carrying on a a long engagement with Mr. Long. Martha Berry expresses her concerns about Audrey being to young to not be having as good a time as other girls without criticism. She tells Mr. Long that she will try to secure him a place in Rome, where there is a new mill and improving business, or at least in Atlanta. 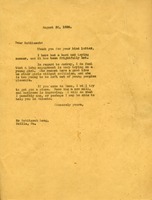 Martha Berry sends a thank you letter that doubles as a letter asking for money to Miss Sarah E. Baldwin, who sent $100 to help a female student named Audrey who just graduated high school and is attending junior college. Invitation to former student inviting her back Berry to get her college degree.